This was a freebie book slipped into the goodie bag for a conference I spoke at in Camden, Maine, in early 2007. I confess that my knowledge of Maine is pretty much restricted to the two-hour drive through a snow-filled landscape from Portland airport to the conference venue, and my knowledge of print-making as an art is not a lot more than my knowledge of Maine, so it is not very remarkable that it took me five and a half years to get around to reading it. It was published in conjunction with The Maine Print Project, which was apparently the largest collaborative fine-arts project in Maine's history (this may not be a hotly contested claim to fame). But it's a nice coffee-table book (if we only had a coffee-table), with some spectacular examples of lithography etc. 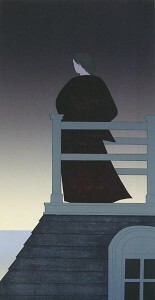 I illustrate with the rather evocative "Dawn", by Will Barnet, which is actually on the book's cover, but there were half a dozen or more where I turned the page and gasped in delight; you will find most of them on the Maine Print Project site. The nineteenth-century section is interesting from a historical perspective, in that some of the artists illustrated were professional printers using their own equipment in their spare time, while others were ladies of leisure who came up the coast from Boston or even New York to sketch evocative images of he Main landscape on their lithographs. It's a nice book to have in the house. And the moral is that if someone in Maine invites you to come look at their etchings, it's probably worthwhile accepting the invitation.